Really committing on the keto diet means not only choosing the right foods but also understanding what is happening to your body as you eat more fat. 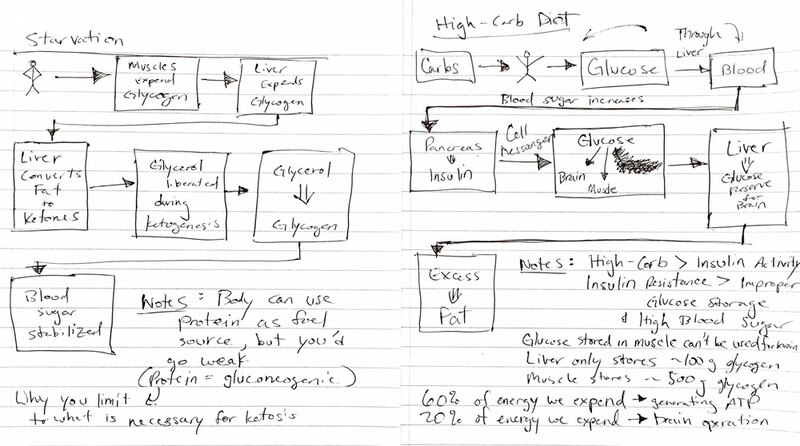 As you can tell from my chicken scratch above, I was a good student while learning about nutritional ketosis! Why is eating fat good for burning fat? Why is a high-carb diet bad? Why do some people not gain weight regardless of their diet? These are all interesting questions that can be explained once you delve into nutrition science and metabolism. Let’s start with a few facts that will help us understand our nutritional needs. Conveniently, your liver has enough capacity to store the glucose needed for your brain for about one day. Unfortunately, the glucose stored within your muscles cannot re-enter your blood stream and be used by the brain. It can only be used as energy for your muscles during physical exertion. Your body and brain are normally fueled by glucose. Most of the fuel is used by normal everyday processes, not physical activity. You can consider this your “resting metabolism”. Your body can only store about one day’s worth of glucose to keep you running. So what happens when there is no food to replenish these stores? When you stop eating food, your body will use up the stored glucose in your liver and your muscles. At this point, it needs another form of energy, and there are two options: protein and fat on your body. Protein can be converted to glucose through a process called “gluconeogenesis”, but as you can imagine, you would become weak as your muscles break down. The better option is fat. And it’s why the length a person can survive without food is proportional to their amount of body fat. Within 24-48 hours without food, your body begins accessing your fat stores for energy. 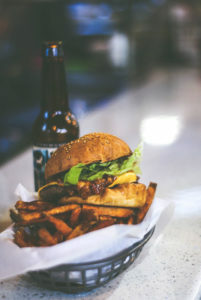 Here’s the catch – fatty acids cannot efficiently cross the blood-brain barrier and first must be converted to “ketone bodies”, which are basically water soluble fat molecules that can be used by the brain. When this occurs in the liver, you are entering a metabolic state called ketosis which can be measured using blood test strips. 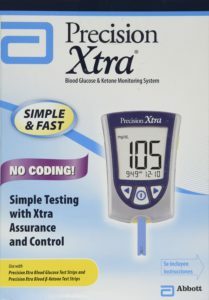 You will know your body is producing ketones when you’ve reached above 0.5 mM. The other side effect of ketogenesis (the process of generating ketones) is stabilized blood sugar. You might think a lack of food would cause your blood sugar to drop to almost zero, however this doesn’t happen because of byproducts from converting fatty acids to ketones, which eventually form glucose. Let’s look at the other extreme to starvation, a high-carb Western style diet. As you eat, your blood sugar rises. This causes your pancreas to release insulin, which is known as the fat storing hormone. The first place it will be stored is within your liver and muscles, as discussed earlier. But when those are full, and you aren’t physically active, the excess gets stored as fat. The more you pound your body with carbs and calories, the more your blood sugar and insulin levels fluctuate. Eventually, your body becomes tired of this unnecessary activity and you form insulin resistance. At this point, your body doesn’t properly distribute the glucose in your blood, and as a result, your blood sugar remains high. This is the precursor to diabetes and a host of other health issues. It should be noted that everyone has a different tolerance to carbs. My friend routinely eats fast food, frozen microwave dinners, and almost no vegetables. At age 33, he’s only now starting to see any fat develop on his belly. One thing most agree on – as we age, our body gets worse at regulating weight on a high-carb diet. There’s a reason adults reminisce about the days they could eat anything as a kid and not gain weight. However, that wasn’t me. I was always on the husky side! 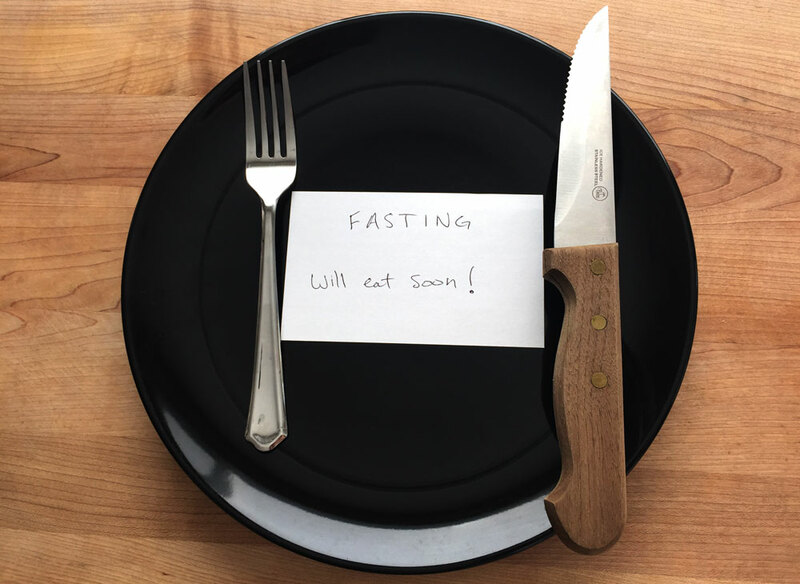 The whole point of following the keto diet is to find the sweet spot where your body mimics fasting, in that you are burning fat as your main source of fuel. But you are still meeting your nutritional requirements, with macro and micro nutrients. If you measure your blood, the desired range is between 1 mM and 3 mM. When you limit carbs on the ketogenic diet, you are constantly depleting your glucose reserves in your liver and muscles. By eating moderate protein, you are able to build muscle. If you overeat protein on the keto diet, your body can convert this excess protein to glucose, disrupting ketosis. Your body must adapt to using fat as the primary energy source and produce ketones. Over time, your body becomes better and more efficient with this process. 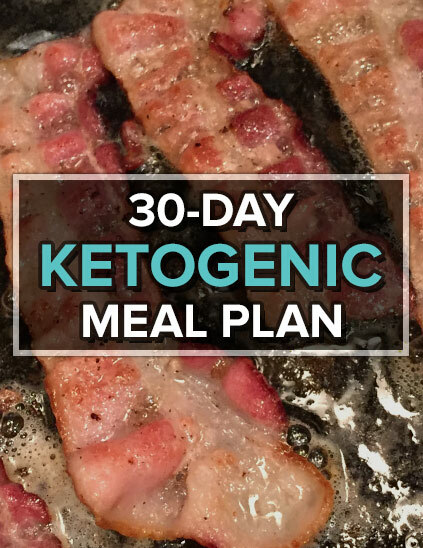 You may not see all the benefits of the keto diet for a month or two. The numbers that you shoot for to achieve nutritional ketosis are completely dependent on your metabolism, body type and goals. For the vast majority of the diet, I was striving for about 70% fat, 20% protein and 10% carbs. A strict ketogenic diet (one used for epilepsy treatment) may be closer to 80-90% fat. It’s really up to you to find out where your body operates best. This could be determined by blood tests, or with the simple “how do I feel right now” test! After binging on carbs a few days ago, I can say that I hadn’t felt that bad and bloated for months. The following day, it was time to get back to using fat as fuel.